Home › Insider › Archive by category "Festivals"
If you are looking for some family fun to get everyone in the Christmas spirit, then look no further! With everything from Santa Claus, to Horse Drawn Carriages, Christmas in Davidson is the place to be. Located in downtown Davidson, the three night Christmas event has something magical to offer everyone. This year Christmas in Davidson is being held on December 5, 6, and 7 from 6pm-9pm. Santa Claus will be present for kids to visit and Mrs. Claus will be doing story time each night. Business vendors will have crafts for children, snacks, and beverages available. Town Hall will be featuring a holiday performance and “make and take” art projects for children. While you are here, make sure to take a ride through downtown, there are two options! Visitors can either take a horse-drawn carriage or a hay ride down Main Street. The horse-drawn carriage rides are $10 per person and run from 6pm-9pm each night. The hay rides are free to visitors and also run from 6pm-9pm each night. The Liberty Stage is a stage for entertainment each night. The Town Hall will also be featuring a performance for visitors to enjoy. There will be a live nativity to help bring to life the reason for the season, as well as a Doggie Fashion Show on Friday night to add a little more fun to the night! There are a variety of ways to get involved in Christmas at Davidson! Whether you are interested in having a booth with your merchandise, sponsoring a tree in the Village of Trees, bringing your dog to compete in the fashion show, or simply signing up to volunteer, the event would not be possible without eager helpers who are excited about celebrating Christmas! 2. Go see Santa! While you have the kids together, take them to sit on Santa’s lap and attend story time with Mrs. Claus. Christmas is such a magical time and this experience will make the holidays that much more special. 3. Take a Ride. Hayrides are free of charge and the horse-drawn carriage rides are $10 per person. This is a wonderful way to see downtown Davidson decorated for Christmas. 4. Volunteer! There are so many different ways to get involved at this event. Find which one fits you and get plugged in! Modern Scottish Festivals began in the middle ages. Athletic competition, “Games”, were a normal occurrence when people gathered together at fairs, military musters, and even funerals. Scottish games how we know them today began in 1781 when the Highland Society of Falkirk sponsored prize money and trophies for competitions in dancing, piping, and athletics during the town’s fall fair. As Scot’s immigrated, they took their sport and culture with them. The games in the United States have grown because many people of Scottish descent still feel the pull of their ancestral homeland and heritage. Tickets for the festival are available online and at the event. The next Scottish Festival and Highland Games will be held on April 12-13, 2014. Each year brings new live music and entertainment to the festival. Every Highland Games Festival offers something different than the previous year, so each time you visit it will be a new experience! There will be a variety of food and drink vendors for visitors to choose from. In addition to food we are accustom to, there will be vendors serving traditional Scottish food. This will allow visitors to try some of the authentic flavors of Scotland and take part in another aspect of the heritage. 1. Get the Family Together and Go! This is such a family friendly event and will be fun for visitors of all ages. 2. Try some Authentic Food. With the Scottish food vendors being present at the festival you will want to try some of the traditional flavor. 3. Participate! Feel free to dress up and make the day that much more memorable. 4. Watch the Games. There will be athletic competitions of all kinds and you will not want to miss the excitement! The North Carolina Brewers and Music Festival is a celebration of music, North Carolina, and it’s craft brewing traditions. Each year there are featured local bands, as many NC brewers who can be there and free tastings of their finest brews for three full hours. This is an event open to the public, for those wishing to participate in the tastings, and those wishing to enjoy the live music and food vendors. If you purchase a 21+ ticket, you will be given admission to the event, a program guide/schedule, and the right to try as many beers as you would like. After the 3 hour tasting period the brewers will transition to selling beer. (Pace yourselves!) If you are interested in a 20 and under or a Designated Driver ticket, you will receive a program guide/schedule, over 9 hours of live entertainment, and access to delicious local food vendors! There will be a variety of food vendors available and will all be reasonably priced. There will also vegetarian options. Last year there were 6 different vendors, this year they are expecting even more! If you have purchased, or plan to purchase a 21+ ticket make sure you bring a valid I.D. Each person will be I.D.’d as they enter! You can also bring lawn chairs, blankets, cameras, rain gear, umbrellas, and pop-up tents(if you’re camping). If you are interested in becoming a vendor, be sure to visit the website at ncbrewsmusic.com to fill out an application. You can also call (704)875-3133 for additional info. 1. Get a Group and Go! This is a great day to spend outside with friends and family, while enjoying music and trying different types of beer. 2. Visit the Vendors. There will be several food vendors, in addition to lots of businesses present at the festival. 3. Camp! Whether you have a tent, camper, or an rv, there is a spot for you and your group. Camping is a great way to stay near the festival and make a mini-vacation out of it! 4. Become a Vendor. If you have a business that should be featured at the festival, consider becoming a vendor and having a table. There will be lots of attendees who will come by throughout the duration of the festival and learn about your business! 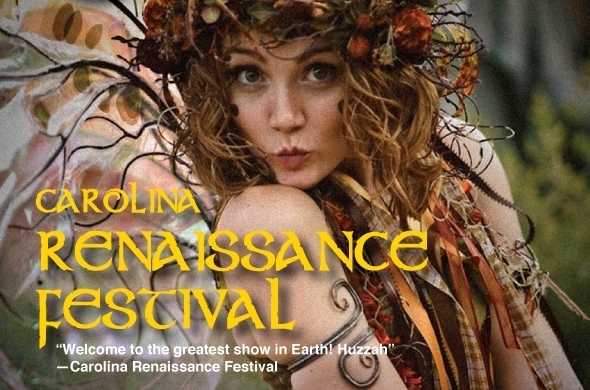 The Carolina Renaissance Festival is a 16th century European style art and entertainment festival combining outdoor theater, circus entertainment, arts and crafts, a jousting tournament, a feast, and much more! It was first introduced in 1994 with six acres of exhibits, attractions, and entertainment. Today it has grown into a twenty acre theme park filled with charming cottages and castles, kitchens and pubs, and lots of games. The Carolina festival has grown to be one of the largest of the Renaissance fairs nationwide. With over 100 purveyors of crafts and food, along with non-stop music and comedy shows, it’s no wonder it is now one of the largest in the country. The festival features over 500 costumed characters, knights on horseback jousting three times each day, the world’s largest rocking horse, 11 stages of music and comedy, rides and games, and artisan demonstrations. The Renaissance Festival is held during the months of October and November. This year the festival begins on October 5 and ends on November 24. It takes place every Saturday and Sunday from 10-5:30. Admission is $21 for Adults and $11 for Children(5-12) when tickets are purchased in advance. Children younger than 5 are free! Tickets can be purchased online and at regional Harris Teeters. Tickets purchased at the box office the day of will be $22 for Adults and $12 for Children(5-12). Tickets are $19 for Seniors(60+), military and military spouses(mist have Valid ID). Children of military are $9. There are also group rates available for groups of 15+. Group rates are $19 per Adult and $9 for Children. 1. Grab some Friends and Go! The Festival is a wonderful outing for friends on the weekend. It’s a great place to try some new things and to make some memories! 2. Attend a Jousting Tournament. How many times in your life will you have the opportunity to watch one of these?? Be sure to go! 3. Eat a Feast. There will be feasts fit for a king, be sure you take part in this and enjoy some of the authentic food! 4. Visit the Stages. With over 11 different stages showcasing music and comedy routines, there will be something for everyone to enjoy! 5. Check out the World’s Largest Rocking Horse. Be sure to have the kids go for a ride and take some pictures! The Race City Festival is a Celebration of Lake Norman Area Arts and Culture and is held along Main and Broad Streets in Downtown Mooresville. The festival is hosted by the Mooresville-South Iredell Chamber of Commerce each year. Local arts and crafts of the Mooresville community, live music, international food, beer and wine garden, and a children’s area with rides and activities are all what make the festival such a hit! The festival brings more than 10,000 individuals out each year. The festival happens, rain or shine. There are two stages used for live entertainment. The festival is typically held on the third Saturday of May. It begins at 9am and runs until 5pm. Visitors are encouraged to come and stay as long as they like! Whether you are interested in making a day of it, or are simply looking to spend a few hours pa-rousing the booths, come and join the fun. Admission to the Race City Festival is free and everyone is encouraged to participate! If you are interested in having a booth, they range from $75-$250 depending on what type of booth you are featuring. Arts and craft, food, business, and non-profits are all types of booths that will be at the festival. 1. Attend! Grab some friends and family and make a day of the festival. Weather is usually perfect in May and you will not want to miss this awesome day in the sun! 2. Get a Booth. If you are interested in showcasing your crafts, business, or edible items, get a booth! The festival would not be made possible without talented locals who showcase their creations. 3. Try Something New! There will be wonderful food vendors and this is a great opportunity to try some local grub. 4. Find A Treasure. Take a little extra spending money for arts and crafts. You may find something you can’t live without!